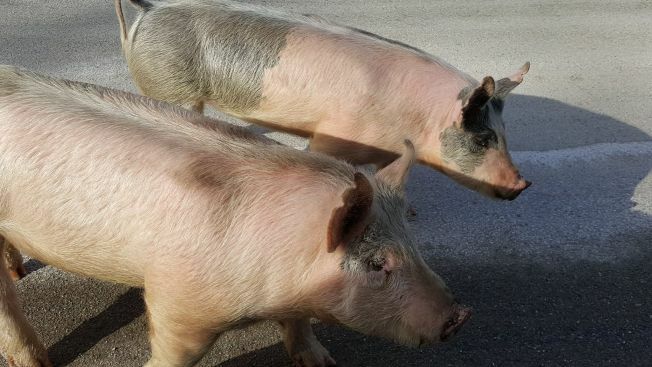 These two pigs were spotted roaming the streets of Merrimack, New Hampshire, on Friday. Two pigs were spotted running around the southwest part of Merrimack, New Hampshire, on Friday, prompting a police response. Merrimack Police posted photos of the pair of pigs to their Facebook page, while acknowleding that they were setting themselves up for lots of jokes about "cops, pigs and bacon." The pigs were reportedly on the loose in the Peter Road area. "They do not belong to us, do not work for us, and are not looking for the market," the police department wrote. Within about 30 minutes, the owner of the pigs contacted police and went to retrieve them. "The power of social media!!!!" the department said.